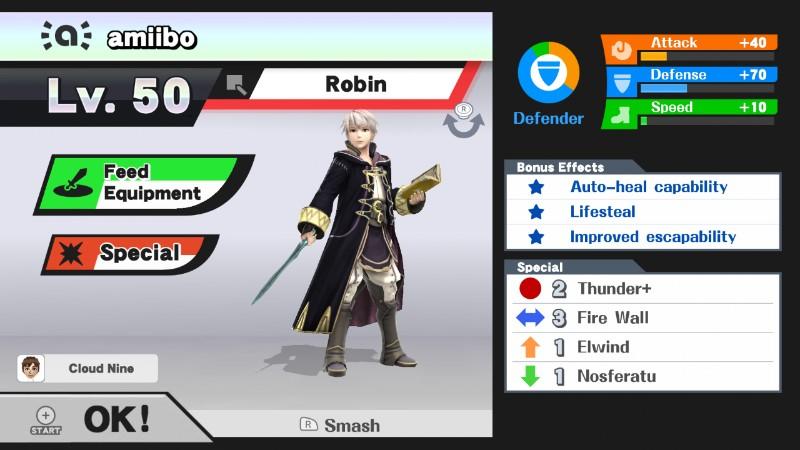 True to his home series, Robin is a character whose moveset is designed to be used carefully for maximum efficiency. The tactician’s most defining traits are his four magic tomes and spells. 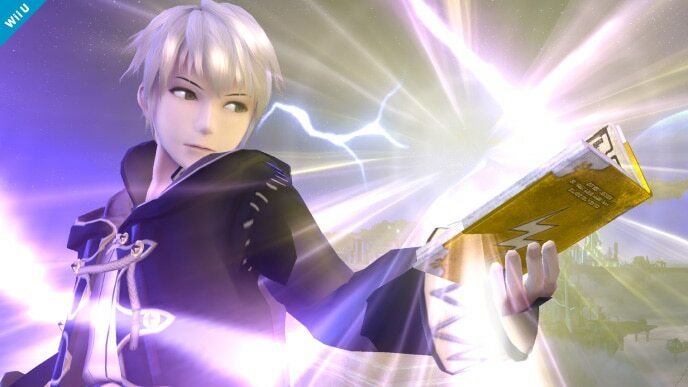 Thunder turns into different spells with different properties the longer Robin charges it, with Thoron, its fully-charged form and Robin’s most powerful spell, being able to travel across the stage and pierce through any enemy in his line of fire. Arcfire is cast a short distance away from Robin and serves to protect him from approaching enemies as it hits multiple times, with the final hit dealing decent knockback. With these two projectiles, Robin can do a great job at keeping his opponent at bay. 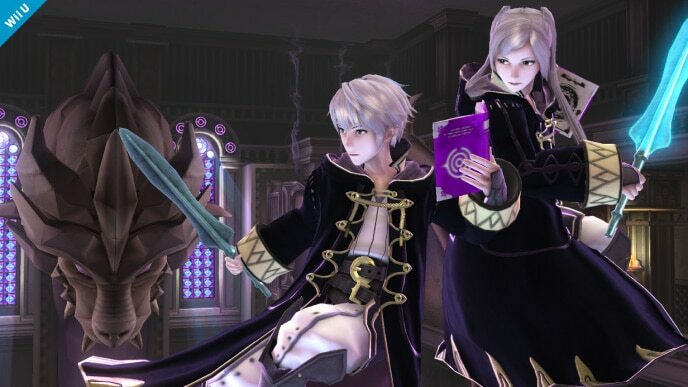 Robin’s last two spells serve more as utility than as attacks: Elwind, Robin’s recovery move, helps him get back to the stage safely (assuming his tome has enough uses in it to do so); while Nosferatu is a command grab that drains the opponent’s health and heals Robin by a good amount. Robin’s smash attacks are nothing to scoff at, being moderately powerful thanks to his Levin Sword – his down smash, which is his best smash attack, is a strong get-off-me attack that hits on both sides, punishes rolls, and prevents immediate counterattacks from his opponent. Robin does have some flaws that could be problematic to his success, one of which is entirely unique to his character: his durability mechanic. A variation of the one used in the Fire Emblem series, the durability mechanic limits how many times Robin can use a certain weapon – when he reaches that limit, the weapon “breaks” and is unable to be used for a set amount of time until it respawns. This means that until his tome(s) and/or Levin Sword respawn, he’s left at a disadvantage, relying on his other available spells and his significantly weaker Bronze Sword for damage. Going in hand with this mechanic is Robin’s tendency to “waste” these weapons – the amiibo may randomly jump and use his Levin Sword in the air multiple times in an effort to hit his opponent, for one. He also overuses his infinite jab attack, which uses his Elwind tome. 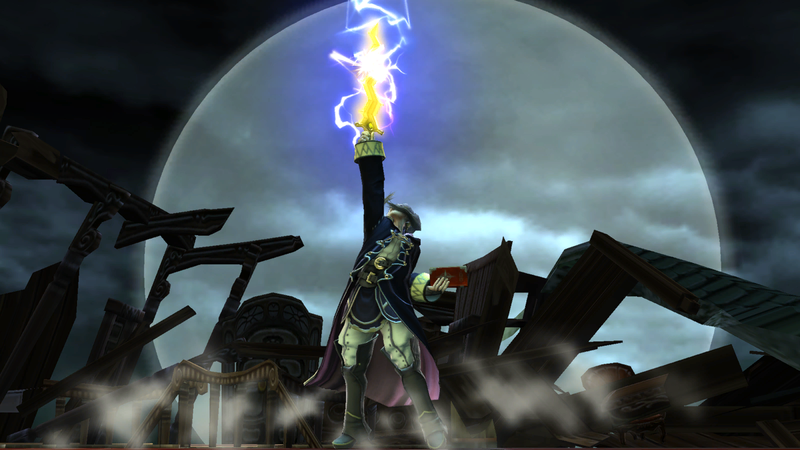 Unlike Robin’s other jab with the Arcfire tome, he can fail to land the final hit on an opponent with the infinite jab. And since this jab uses his Elwind tome, it detracts uses for his recovery, making this jab even worse for him since Robin needs to use Elwind to recover – use it too many times, and Robin is left helpless, falling to his demise. Robin also lacks in melee range, making foes that bypass his long-range spells a problem; his tilts, while fast, possess mediocre range and above-average endlag, and his command grab, Nosferatu, doesn’t have the best range as well and can easily be whiffed. His smash attacks, which are his most important melee attacks, lose significant range when his Levin Sword breaks and become much weaker and easier for his enemies to exploit. And finally, as mentioned in the preceding paragraph, Robin’s grab is slow, being among the slowest in the game. If he whiffs a grab, you can expect a counterattack from his foe. Robin is by no means a bad amiibo, as he has great projectiles and smash attacks on top of having proper AI that can utilize these to their maximum efficiency. That being said, it’ll take him a good while to unlock his true potential on the battlefield. He can be a bit tough to figure out and train, but with the help of this guide, you’ll be on the right track on making this fighter a master tactician. Thunder+: This is a custom move version for Robin’s neutral special. It hits much harder it makes it easier to nab a KO at the cost of having less durability and a slower charge. While its charging time and durability are slightly less reliable than its default, the damage output it provides is significantly higher, with Thoron+ becoming a safe kill move on top of having the power to shatter full shields. Fire Wall: A custom move option for Robin’s side special. Its damage output and range are significantly reduced, but Robin is able to cast it faster. It’s best used as an edgeguarding tool and a get-off-me move, but the default Arcfire has its fair share of uses, too. It’s ultimately up to you to decide which custom would be best for your Robin amiibo. Neutral options: Thunder+ and side special. At the start of every match and when you’re a short distance away from your amiibo, try and charge Thunder all the way up to Thoron. It’s the best spell in Robin’s arsenal and unlike many amiibo who have problems charging up projectiles (such as Lucario with its Aura Sphere and Mewtwo with its Shadow Ball), Robin will always effectively charge Thunder. When you fully charge Thunder, unleash Thoron onto your amiibo. Use Arcfire to space when your amiibo is approaching from far away; if you’re using the Fire Wall custom instead, use it as an edgeguarding tool as well. Main KO moves: forward smash, down smash, and Thunder+. Forward smash is Robin’s strongest move – with the Levin sword active, it KOs opponents at around 100%. That being said, down smash is generally more reliable; it’s slightly weaker but covers both sides. When fully charged, Thunder+ is also a good KO move. Moves to avoid: infinite jab and grab. Robin’s infinite jab uses his Elwind tome to attack. Not only does he miss landing the final hit of the jab on opponents at lower percents, he may also learn to spam this move relentlessly. Stay clear from using it at all, since it also detracts uses from his Elwind tome, which he uses to recover. Instead, use the other version of this jab (the one with the Arcfire tome) as it hits more reliably and doesn’t hinder Robin’s recovery. As for Robin’s grab, keep its usage to a minimum. It’s too slow to be worth trying. Situational moves: forward tilt, up tilt, down tilt, and Nosferatu. When Robin loses his Levin Sword, his smash attacks become weaker, and he must then rely on tilts and Nosferatu instead. Down tilt, forward tilt and his jab (using his Arcfire tome) are his best options to put some space between close-range fighters. Nosferatu can be mixed in here, too, but it can be difficult to land and has limited uses; nevertheless, it’s still an effective move for Robin to learn. Thanks to Arklaine for compiling Robin’s information. Images are courtesy of SmashWiki and the official Super Smash Bros. website.